This is how good a tea bottle can be. No matter where or when: You will always have your tea on hand. 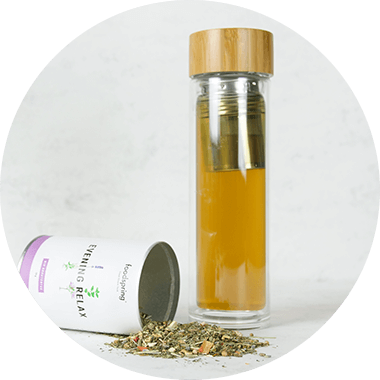 Our thermal tea bottle will keep it warm. Or cold. It will not leak and is much more shatter-resistant than normal glass. And best of all: It also looks fantastic. Scratch-resistant. Leak-proof. Stainless. Naturally in surgical quality. Our tea bottle can handle quite a lot. Fluctuating temperatures have nothing on its heat-resistant borosilicate glass. It is much sturdier in your bag than standard glass. And its lid, made of real bamboo wood, also makes it look fantastic. 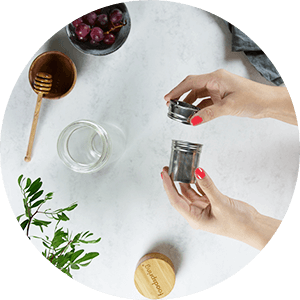 The 2-in-1 sieve, made of removable, surgical-quality stainless steel, gives the bottle a more elegant look. Tea. Iced tea. Infused water. Our thermal tea bottle does what you want. Its 400 ml capacity can hold up to two large tea cups. 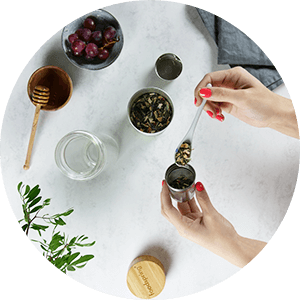 It will keep your favourite tea hot or cold – just as you like it. Scared of puddles in your bag? There is really no need. 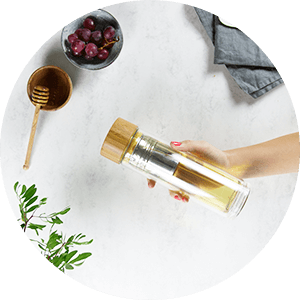 When properly closed, our tea bottle is just as secure as any other water bottle. 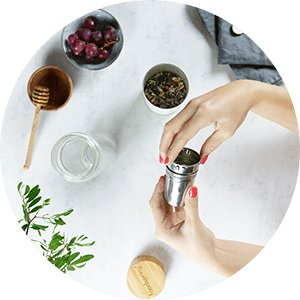 It has never been easier to make tea. 1. Remove the sieve from the bottle and screw it open. 2. Fill it with tea. Is the tea bottle dishwasher-safe? Yes; you can wash both the bottle and sieve in the dishwasher. It is better to wash the bamboo lid by hand, so that is maintains its shape and stays in good condition. Even if the sieve is sitting tight: A simple turning motion will help unscrew the sieve from the bottle. It will become easier to screw in and out over time. Yes, for normal use around the house, definitely. You can fill boiling water directly into the bottle. You can even go for a stroll in -20°C weather without anything bad happening. Even so, it is probably best to not place it in the freezer. Borosilicate glass is highly temperature and chemical-resistant. It is used in households where higher sturdiness and shatter-resistance than standard glass are required. Borosilicate glass is even right at home in laboratories and chemical engineering. 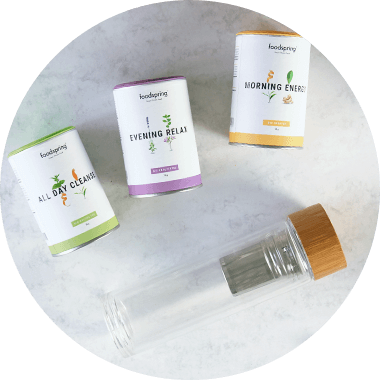 foodspring Tea Bottle will be back in stock shortly.